Extension cables for use with OptiMate Battery Chargers with SAE connectors. With new improved SAE-compatible connection lead. 1.8m long (6ft). Extension cables for SAE compatible OptiMates to enable them to be used further from the vehicle or battery. 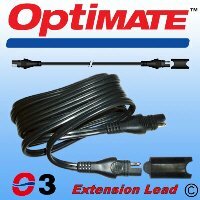 Simply plug one end into the outlet lead of the OptiMate and the other end into the accessory cable (e.g. eyelet lead as supplied with OptiMate, or other SAE accessory). Heavy-duty cable to prevent Voltage drop. This new SAE compatible lead is supplied with a detachable rubber sleeve to form weatherproof joints with other OptiMate SAE accessory leads.